I crafted this recipe when I finally realized that I don't like lettuce. It's fine on a sandwich, but I don't need to fork a mouthful. 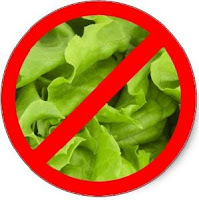 It was this revelation that lead me to the fact that it was lettuce that was holding me back from eating salads on a daily basis. I liked everything else in a salad and I was missing out on the healthy goodness of all that, because of the lettuce! So I scrapped it! My2Cents: I divide this salad into five Anchor Hocking glass containers (Pyrex works too) and take to work for lunch. It's not enough to satisfy as your only lunch item, but I typically have it as an appetizer to a Kashi frozen entree. Am I the first to come up with this concept? No. Google lettuce-less salads to explore more recipes. LOL>>>Kimmy...How funny you should say that about leafy lettuce..I use way less and more veggies in my salads..giggle..I cut up broccoli, carrots, cauliflower, tomatoes, beans..oh and I chop up some garlic omg with a red wine vinaigrette .. its the bomb! I was intrigued with this recipe so I gave it a try. I actually made it for a potluck item at my church's Thanksgiving meal. I had one "it's very good" comment and I thought it was great! (I'm sure others loved it too, they just didn't know how to tell.) I ended up adding avocado (which was good) and it turns out I bought honey roasted sunflower seeds (vs. regular), but they tasted pretty good against the lime juice and red onions. Thanks for the idea, Ms. Hoff!